Squids have a light, subtle taste and a high recovery rate, and are firm yet tender. Cuttlefish flavour is mild. To produce tender cephalopods, cook them quickly (for less than 2 minutes) over a high heat, or slowly simmer or braise. Their ink can darken sauce or colour pasta, and they can be used on skewers and in tempura and pasta sauces. Squid is popularly served as deep fried rings (often called calamari). The squid is sliced into rings, or kept flat and scored diagonally, crumbed, deep fried and served with tartare sauce but try chilli jam instead. Squid can be coated in sea salt and cracked black pepper, seared very quickly on the barbecue over a high heat, and served with a mixture of lime juice, palm sugar and tamarind. Stuffing squid is a versatile method of preparation. Olives, onion, parsley and breadcrumbs make a good base then the options are endless. Poach in a court bouillon for added flavour and serve with capsicums, capers, fennel, tapenade and a reduction sauce of the squid ink, if desired. Due to its texture, squid is also suitable for casseroling. Tenderise squid and cuttlefish with raw papaya or kiwifruit in milk 2-4 hours before cooking. Price These are low-priced molluscs. Calamari is higher priced than others, with Gould s squid the lowest priced. Squid rings with tartare sauce are best accompanied by a youthful riesling. With squid served seared and spicy, offer full-flavoured chardonnays to combat the forcefulness of the tamarind, sugar and lime mixture. Subtle wines such as colombard or chenin blanc complement cuttlefish. 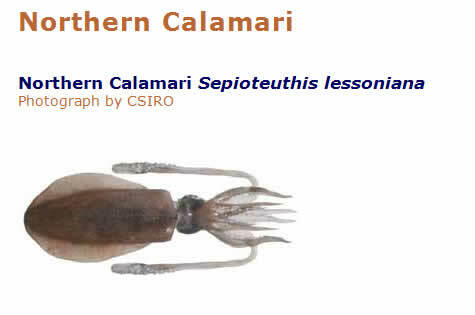 Northern calamari: year round, with peak supply over winter. Various fishery closures occur. Alternatives AlternativesCuttlefish and squid can generally be used interchangeably. Grading Grading can vary by supplier and region. An example of grading systems for squid is presented below. When referring to squid tubes, terminology such as U-10 or U/10 is pronounced under ten and refers to the number of tubes per kilogram (in this case, fewer than ten tubes per kilogram). 10 – 20 is pronounced ten twenty and means that there are from 10 to 20 tubes per kilogram.